Ahilya Rangnekar came from a progressive family influenced by the values of the social reform. The family’s four daughters, and the daughters-in-law were graduates. On 8 August 1942, in response to the declaration of the 'Quit India' movement, Ahilya joined the students in enforcing a strike in their college. On 15 August, hearing of the death of Gandhiji's secretary Mahadevbhai Desai in jail, Ahilya led her student friends in a protest march, resulting in their arrest. They were sent to Yeravda jail as Class B prisoners for three months. In prison, she and her comrades worked with Class C prisoners who were given poorer quality of amenities and food. They mobilised women prisoners to donate coloured saris with which they stitched together and hoisted the Congress tricolour on the prison wall standing on a human pyramid. As punishment, Ahilya and co-inmate Indutai Kerkar were confined in a tiny cell for seven days. Meanwhile, she was rusticated by Fergusson College and came to Mumbai to complete her graduation. She was drawn into the struggles of the mill workers and became active in the Girni Kamgar Union (Lal Bavta). In 1943, Ahilya joined the Communist Party of India. Along with other communist women freedom fighters, she formed the Parel Mahila Sangh to organise women in the Lalbagh-Parel area. They raised demands for maternity leave and better wages for women mill workers. With a strong base amongst the mill workers of Mumbai and their families, they took up the issue of the shortage of milk and other essential commodities during the war, forcing the government to supply them at controlled prices. During the Royal Indian Naval Ratings (RIN) Mutiny in February 1946, the Parel Mahila Sangh organised food for the striking sailors from the homes of mill workers and organised the Koli (fisher caste) women to deliver the food. In the firing by British soldiers on striking mill workers below Elphinstone Bridge at Parel on February 22, her comrade Kamal Donde was killed, her sister Kusum Ranadive was shot at in both her legs. Ahilya escaped. 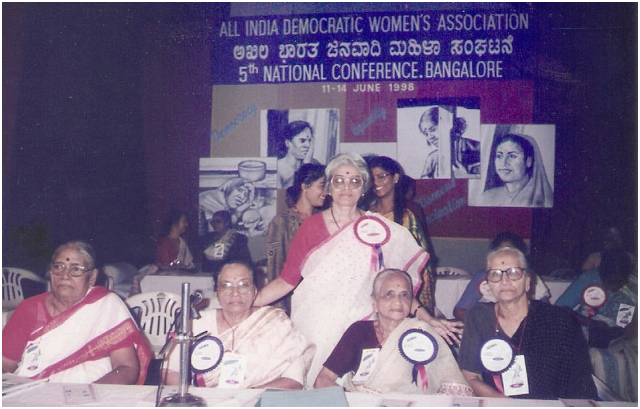 The Parel Mahila Sangh later became the Janwadi Mahila Sangh, the Maharashtra state unit of the All India Democratic Women’s Association (AIDWA). Following Independence, Ahilya was among the leaders of the struggle in support of the Hindu Code Bill of 1950, a movement spearheaded by Babasaheb Ambedkar and vehemently opposed by M.S. Golwalkar and others of the Rashtriya Swayamsevak Sangh. She was renowned also for her fearless participation in the Samyukta Maharashtra movement that started in 1950, a role that prompted Acharya Atrey, the leading Marathi poet and writer, to refer to her as “Ranaragini Ahilya” in a poem. She was elected corporator of the Bombay Municipal Corporation from 1961 and held that position for 19 years. Besides that she held several important positions in various left organisations. She later became the national working president of the AIDWA and in 2001, its patron. 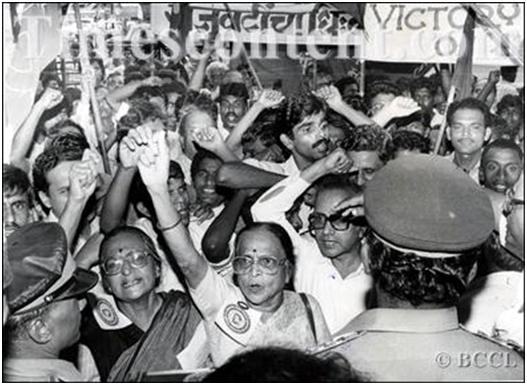 She was the secretary of the Maharashtra state unit of the CPI(M) from 1983 to 1986. She was the member of its Central Committee from 1978 to 2005. In 1975, she was elected to the General Council of the Centre of Indian Trade Unions and, in 1979, became its vice president. She worked untiringly to improve civic amenities for the Mumbai’s poor and deprived. She had connections in different areas and worked among the poorest people — slum dwellers and shantytown dwellers; contract workers; anganwadi workers and home-based workers; and women who worked at home for no wages. She fought for the rights of women, for the rights of hutment dwellers; she fought for better water supply, and so on. Despite frail health and failing eyesight in her last years, she continued to remain active and engaged with politics and people. Her last public appearance was on March 8, 2008, when she spoke at a women’s convention on the occasion of Women’s Day. 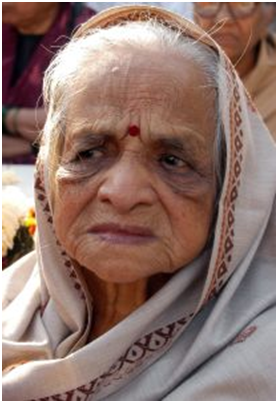 Aged 87, she died in the early hours of 19 April 2009 in her home on Bhao Daji Road in Mumbai. Read more from our #WomenFreedomFighters series. Read about Godavari Parulekar here and Janaki Ammal here.